A 32-year-old Will County Sheriff’s deputy in Illinois currently in the ICU wing of the hospital as a result of injuries sustained when an SUV stopped in front of his patrol car, causing the officer to swerve, lose control, and crash into a telephone pole. 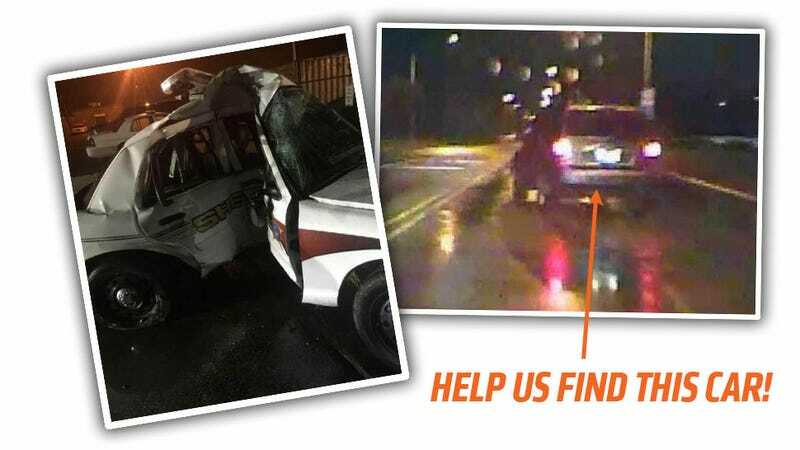 Police need help identifying the SUV, so let’s see what we can do. Last week, my girlfriend’s cousin, a Will County, Illinois police deputy named [name redacted due to open investigation], was critically injured when an unidentified vehicle ran his cruiser off the road (with lights and siren on no less). After being extracted from the vehicle, he was rushed to the hospital, where he remains in the ICU. I know these sorts of things have been posted on Jalopnik previously, and we hoped you might consider sharing the attached photos in an attempt to help determine the make/model/year of the vehicle that caused the accident. The offending driver failed to yield, stop to help, or even report the accident that left this 32 year old in the ICU fighting for his life. Please consider this request — feel free to add or delete as much info as you need. No need to share the link either if unnecessary. The only item of importance is determining the year, make, and model of the vehicle if possible. Please help — [name] is a good man and a good cop. The photos available are from the dash cam of the patrol car, and the quality isn’t great. To me, I think it looks like a Ford SUV, like a fairly recent Expedition, but I’m not 100 percent sure. But I suspect, collectively, we can figure it out. The damage from the wreck caused by the SUV pulling into the cop’s lane and stopping is alarming. The Crown Vic patrol car hit the pole on the passenger side door, and the car seems to have just wrapped around the pole. Any help will be appreciated. Feel free to speculate in the comments, and if you have more concrete information, shoot us an email and I can give you direct phone contact to Charlie, who contacted us.